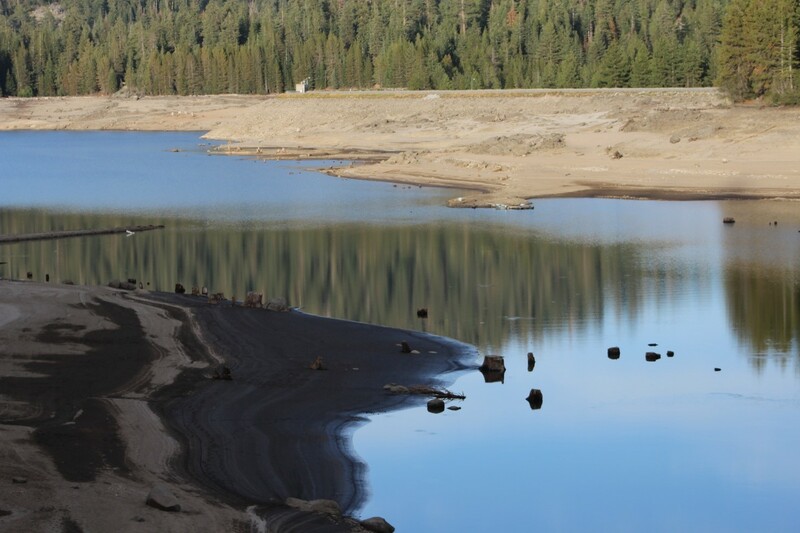 Southern California Edison Company’s Huntington Lake, at the 7,000 foot elevation in Fresno County, is usually nearly full until Labor Day. Because of the drought, its storage as July was concluding was less than 42% of its capacity. It’s only the beginning of August but there is now less water stored in the nine San Joaquin River reservoirs than the total storage capacity of Millerton Lake. The U.S. Bureau of Reclamation reported July 30 that total San Joaquin River in storage amounted to 504,178 acre-feet. Millerton Lake behind Friant Dam holds 520,500 acre-feet on its own. Total reservoir capacity is 1,132,188 acre-feet. None of that means much these days to those who would normally be using Central Valley Project water from the San Joaquin River. Across the CVP’s 1.2 million acre Friant Division, Reclamation’s water supply declaration remains stuck on zero, an unprecedented situation created by drought and what many Friant officials believe were mistaken USBR water management decisions over the past several months. Releases into the Friant-Kern and Madera canals continue to be at flows more typically seen in late fall and winter. As of July 30, the Friant-Kern Canal was taking 236 cubic feet per second and the Madera Canal just 67 c.f.s. Both amounts are mere trickles, especially at the peak of the summer heat and irrigation demand. Through the first 30 days in July, Friant-Kern diversions amounted to only 12,978 acre-feet with 9,342 acre-feet released into the Madera Canal. A small amount of those releases is from limited Millerton Lake storage carried over 2014 by some Friant contractors. Other canal releases are as a result of arrangements made with the San Joaquin River Exchange Contractors, four western San Joaquin Valley agencies with senior rights. There is water being introduced into the Friant-Kern from pumps by growers who are using the canal to “wheel” water to downstream properties. Some unused San Joaquin River Restoration interim flow water continues to be released from banking by the Fresno Irrigation District. Otherwise, Friant users are having to rely on groundwater, which is resulting in what is expected to be a massive groundwater overdraft this year, or some entitlements to water on other streams. The Exchange Contractors for the first time in the Friant project’s history are receiving San Joaquin River water for diversion because Reclamation says it is “unable” to meet its obligations to provide a substitute Delta water supply. There is no indication that the situation is going to get any better anytime soon. A few valley showers and mountain thunderstorms spawned in late July by surges of tropical air barely dampened the dust and hopes for a climate change into a wetter pattern during the coming fall and winter months are fading as longer-range weather forecasts become increasingly less optimistic.